Located minutes to Walt Disney world resort and designated as a Walt Disney world good neighbor hotel. Our all suite resort is the perfect spot for your upcoming visit to Orlando. The resort offers the full service reflections spa and salon Frankie Farrells Irish pub pizza hut cafe and Lanis luau poolside tiki bar. Two seasonally heated pools one with the pirates plunge pirate ship for the kids. Within the village is world class factory outlet shopping at the Lake Buena Vista factory stores. The resort offers one to four bedroom condo style suites with full kitchens living room dining room private balcony and in-suite washer/dryers. If location is everything then Lake Buena Vista Resort Village and Spa has it all. 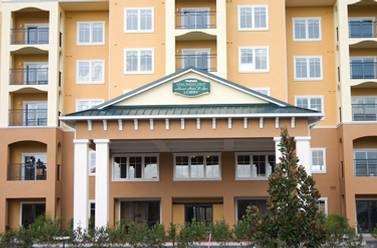 Located minutes from Walt Disney world resort and downtown Disney in beautiful lake buena vista. Reservations must be cancelled by 6pm- 72 hours 3 days prior to arrival date to avoid forfeiture of deposit. Exceptions may apply - please see rate rules. Whether youre coming to compete train or view a game at this mammoth attraction you will enjoy your experience. This state-of-the-art sports facility includes Champion Stadium-with professional caliber Baseball Quadroplex. SeaWorld Orlando offers the perfect blend of education and entertainment. This marine adventure park has 200 acres of shows rides and animal encounters.Your family will love the excitement of getting close enough to touch many of the wonders.